RICHMOND, Va. (AP) — Corpses, cancer patients and diseased lungs are among the images the federal government plans for larger, graphic warning labels that would take up half of each pack of cigarettes sold in the United States. Whether smokers addicted to nicotine will see them as a reason to quit remains a question. 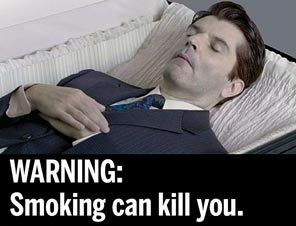 The images are part of a new campaign announced by the Food and Drug Administration and the Department of Health and Human Services on Wednesday to reduce tobacco use, which is responsible for about 443,000 deaths per year. "Some very explicit, almost gruesome pictures may be necessary," FDA Commissioner Margaret Hamburg said in an interview with The Associated Press. "This is a very, very serious public health issue, with very, very serious medical consequences," such as cancer, heart disease, strokes and lung diseases. The share of Americans who smoke has fallen dramatically since 1970, from nearly 40 percent to about 20 percent, but the rate has stalled since about 2004. About 46 million adults in the U.S. smoke cigarettes. In the same period, the average cost per pack has gone from 38 cents to $5.33. Much of those increases are from state and federal taxes. It's unclear why declines in smoking have stalled. Some experts have cited tobacco company discounts or lack of funding for programs to discourage smoking or to help smokers quit. The new prevention plan is part of a law passed in June 2009 that gave the FDA authority to regulate tobacco, including setting guidelines for marketing and labeling, banning certain products and limiting nicotine. The law doesn't let the FDA ban nicotine or tobacco. The FDA is proposing 36 labels for public comment. They include phrases like "Smoking can kill you" and "Cigarettes cause cancer" and feature graphic images to convey the dangers of tobacco. "It acts as a very public billboard because you all of the sudden are reading something about lung cancer from that pack behind the cash register, whereas before you were just reading 'Marlboro,'" said David Hammond, a health behavior researcher at the University of Waterloo in Canada, who is working with the firm designing the labels for the FDA. Some of the labels include a man with a tracheotomy smoking a cigarette, a cartoon of a mother blowing smoke in her baby's face, rotting and diseased teeth and gums, as well as cigarettes being flushed down the toilet to signify quitting. The agency will select the final labels in June after reviews of scientific literature, public comments and results from an 18,000-person study. Cigarette makers will then have a year and three months to start using the new labels. The new warning labels are to take up the top half of a pack — both front and back — of cigarettes and contain "color graphics depicting the negative health consequences." Warning labels also must constitute 20 percent of advertisements. In recent years, more than 30 countries or jurisdictions have introduced labels similar to those proposed by the FDA. The U.S. first mandated the use of warning labels stating "Cigarettes may be hazardous to your health" in 1965. While it is impossible to say how many people quit because of the labels, Hammond said every source of evidence suggests that the labels do spur people to quit. The labels should shock people and be effective in deterring smokers, but how much is the question, said Marvin Goldberg, the Bard professor of marketing at Pennsylvania State University. "There's no silver bullet. Will this wipe out smoking? No, but it will put a dent in it," Goldberg said. Graphic labels "are tremendously effective," said Stanton Glantz, a tobacco researcher at the University of California at San Francisco. He said the argument that the warning labels are offensive, so people ignore them, has been cooked up by cigarette companies. If that were true, the tobacco industry wouldn't be fighting them so hard, Glantz said. Reynolds American Inc., parent company of the nation's second-largest cigarette maker, R.J. Reynolds, is reviewing the labeling plan. But spokesman David Howard said the legality of the new labels is part of a pending federal lawsuit filed by the company, No. 3 cigarette maker Lorillard Inc. and others. The tobacco makers in the suit had argued the warnings would relegate the companies' brands to the bottom half of the cigarette packaging, making them "difficult, if not impossible, to see." Anti-tobacco advocates are applauding the federal campaign and the new warning labels. "This is going to stop kids from starting to smoke ... and it's going to give smokers a strong incentive to quit smoking," said Patrick Reynolds, grandson of R.J. Reynolds and executive director of the Foundation for a Smokefree America. Reynolds' father, brother and other relatives died from smoking-related illnesses. Smokers themselves were skeptical that the labels would have much effect. "I don't think they're going to be a deterrent at all for people who already smoke. Most people start smoking when they're young, and I don't think they're going to think about the effects," said 27-year-old Zak Hoffman of Cincinnati, who has been smoking since he was 14. "I think more tax increases would have more of an effect than scare tactics," said 20-year-old Gina Gatano, a student who works at a downtown Cincinnati coffee shop. AP Business Writer Dan Sewell in Cincinnati, AP Marketing Writer Emily Fredrix in New York and AP Medical Writer Lindsey Tanner in Chicago contributed to this report.